Cook chicken breasts and cut up into bite size pieces. In a saute pan over low heat, add cooked chicken, lemon juice, tomato, olive oil and garlic and cook about five minutes until tomatoes soften. Boil noodles according to package directions and drain. Place noodles back in the pan, stir in pesto and the chicken and tomato mixture. Garnish with parmesan cheese and basil, if desired. Serve immediately. I enjoy growing fresh herbs in my garden and in various containers on my deck. I do not consider myself a “green thumb” but I can really grow basil. I find that it grows alright indoors, where I like to keep the herb in a container until the threat of frost is gone. Once the weather cooperates, I will move my basil to the outdoors in a sunny spot on my deck. With easy care including plenty of summer sunshine and constant watering, I find that my basil plants seem to really take off and grow. That is when I get excited because happy basil plants mean I am well on my way to having some fresh pesto. What I love about pesto is that it is so versatile. I enjoy using pesto as a spread on sandwiches, particularly on the Pesto Egg Sammy recipe featured here. The combination of flavors is amazing and it is the kind of breakfast that will keep me from being hungry much before lunchtime. 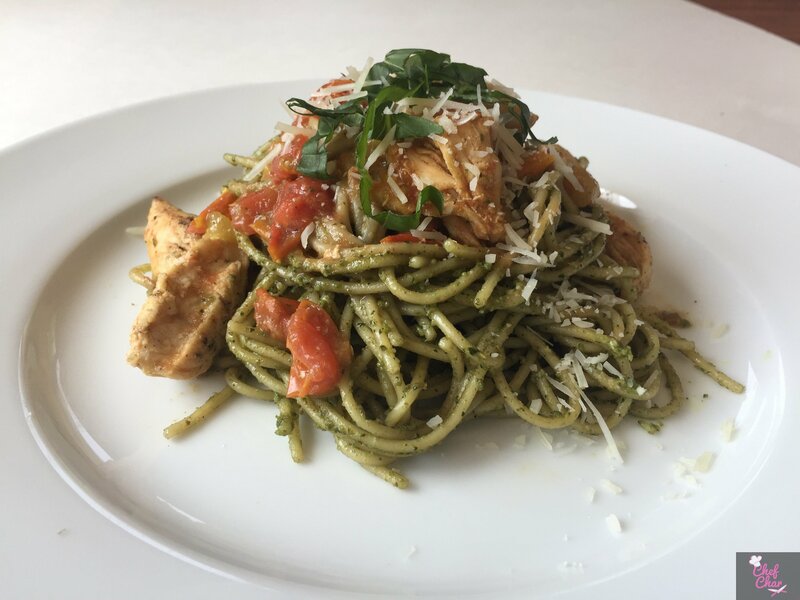 I also like to use pesto on any type of pasta and then add shrimp or chicken along with tomatoes and a little extra parmesan, such as in the Chicken Pesto Pasta recipe I am sharing.